Internet Dental Alliance announces its Dental Marketing Intelligence Report™, designed to help dentists target profitable markets. With the information in IDA's Dental Marketing Intelligence Report™ I can predict what dental consumers want – and which kinds of potential new patients are going to set appointments for dental treatment. The Dental Marketing Intelligence Report™ from Internet Dental Alliance, Inc. (IDA) is now available to help dentists plan strategic lead generation campaigns to grow their practices. The Report analyzes Google keyword search data from dental consumers in more than 10 dental markets. It identifies changes in consumer demand, search volume for the most popular dental treatment keywords, cost to acquire new patients and market profitability. Armed with this information, dentists can make informed decisions about which kinds of new patients are the most profitable to target with their lead generation campaigns. Dental consumers routinely search the internet for information to help them make purchasing decisions. At the beginning of the buying cycle, people look for general information to learn about the product or service they're considering. For example, they'll begin with a keyword phrase such as "braces for adults". As they learn more about their available options, the keywords become more specific, such as "invisible braces". When they've narrowed their choices and made the decision to buy, the searches include brand names -- such as "Invisalign® braces". 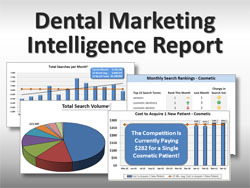 "With the information in IDA's Dental Marketing Intelligence Report I can predict what dental consumers want – and which kinds of potential new patients are going to set appointments for dental treatment!”,” said dental management consultant Jim Du Molin, founder of Internet Dental Alliance, Inc.
IDA's Dental Marketing Intelligence Report™ identifies and analyzes the top 15 of these search terms in each of 10 dental markets. By value-weighting the cost to advertise on Google using each of these keywords (cost per click), the report derives the cost to acquire new patients in each of the top 10 markets. By comparing these results with consumer demand in each of 10 dental markets, the Report gives a clear picture of which markets are becoming more profitable and which are standing still. Dentists who want to grow their practices can then decide which services to offer for the highest return on investment (ROI).